You should read dog food labels carefully to avoid foods with the following chemicals and additives. These are some of the common preservatives in commercial dog Foods. BHA (butylated hydroxyanisole): This is a chemical preservative and antioxidant that, whole generally regarded as safe in low concentrations, may cause allergic reactions and affect your dog’s liver and kidney. BHT (butylated hydroxytoluene): Although this preservative and antioxidant is believed to be generally safe, it may cause liver and kidney problems. Ethoxyquin: Depending on the dosage, this preservative, rubber hardener, insecticide, and pesticide may cause cancer. Ethylenediamine: This solvent, urinary acidifier, and color promoter can irritate the skin and mucus membranes and may cause asthmatic reactions and skin rashes. Sodium metabisulphite: Another chemical preservative, sodium metabisulphite has caused weakness, loss of consciousness, difficulty swallowing, and brain damage in people. Sugar, sorbital, ethylene glycol, and propylene glycol: These preservatives and sweeteners may contribute to diabetes and obesity. 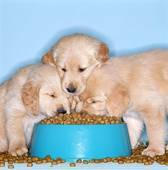 Previous PostCommon Byproducts in Commercial Dog FoodNext PostAre You as Good as Your Dog?